One of the most remarkable developments in Computer Science over the past 30 years has been the realization that the ability of computers to toss coins can lead to algorithms that are more efficient, conceptually simpler and more elegant that their best known deterministic counterparts. Randomization has by now become a ubiquitous tool in computation. This course will survey several of the most widely used techniques in this context, illustrating them with examples taken from algorithms, random structures and combinatorics. Our goal is to provide a solid background in the key ideas used in the design and analysis of randomized algorithms and probabilistic processes. Students taking this course should have already completed a good Algorithms courses (with theoretical underpinnings), and have excellent Maths. news: (7th April 2019) The 2nd coursework is now marked, and you can collect your marked scripts from the ITO from early on Monday 8th. Solutions/marking scheme are here. Our first lecture in 2019 will be Tuesday 15th January, in G3 of the Bayes Centre. If you have not taken the Algorithms and Data Structures (ADS) course (or similar in another University), you should take that first unless you are a very strong student. You can take a look at the 2016/17 exam paper and/or the 2017/18 exam paper. All prospective students should do the Self test I have created. When you have finished (it will take an hour and half or maybe two) drop me a message asking for solutions. You should be able to do about 70% of the questions without Googling or needing help - say 10 of the 15 questions. The School has published Last year's Survey report based on feedback from some 2017/18 students. I have written a response to the survey. 11:10-12:00 Tuesday in room G3 of the Bayes Centre (Potterow). 11:10-12:00 Friday in room 3.2 of the Lister Centre (5 Roxburgh Place). 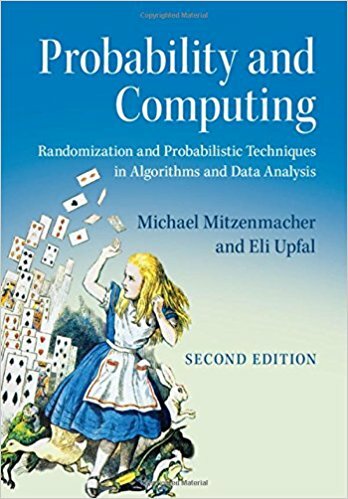 Textbook: The required textbook for the course is ``Probability and Computing: Randomized Algorithms and Probabilistic Analysis" by Mitzenmacher and Upfal. Assessment: A written examination contributes 80% of the final grade. The remaining 20% will be based on the second (pencil and paper) homework exercise. Lecture recording will appear in Learn; also I will add direct links to the lecture schedule). Lectures 1-3 (January 15, 18, 22) Introduction. Elementary examples: identity testing, verifying matrix multiplication, randomized min-cut. (Chapter 1 of [MU]). lecture2.pdf, lecture2-4.pdf on Matrix Multiplication Verification. lecture3.pdf, lecture3-4.pdf on Karger's Min Cut. Lectures 4 and 5 (January 25 and 29) Discrete Probability (random variables, independence, expectation, variance, moments). Markov's inequality, Jensen's inequality, Chebyshev's inequality. Application: Coupon collector's problem. (Sections 2.1, 2.2, 2.4 and 3.1-3.3 of [MU]). Lectures 18-19: (March 22 and 26) Mixing-time of Markov chains. Feedback was returned on 7th March, solutions/mark-scheme is here. Coursework 2 (summative): due 4pm, Tuesday, 19th March. Feedback was returned on 8th April, solutions/mark-scheme is here. Academic Conduct Policy: Students are expected to adhere to the academic conduct policy of the University; this policy can be found in full here. Late Coursework Policy: Please see here for the late coursework policy of the School of Informatics.